Those of you familiar with our work will know that we consider being able to maintain comparatively fast cruising speeds the most important factor in safe, comfortable ocean crossing. Get this right and you enjoy making passages. Get it wrong and you will prefer sitting at the dock reading about the folks who are really out there cruising. Our theoretical numbers now have the benefit of many thousands of miles of real world experience, both our own with FPB 83 Wind Horse, and those of the seven FPB 64 owners now actively cruising. 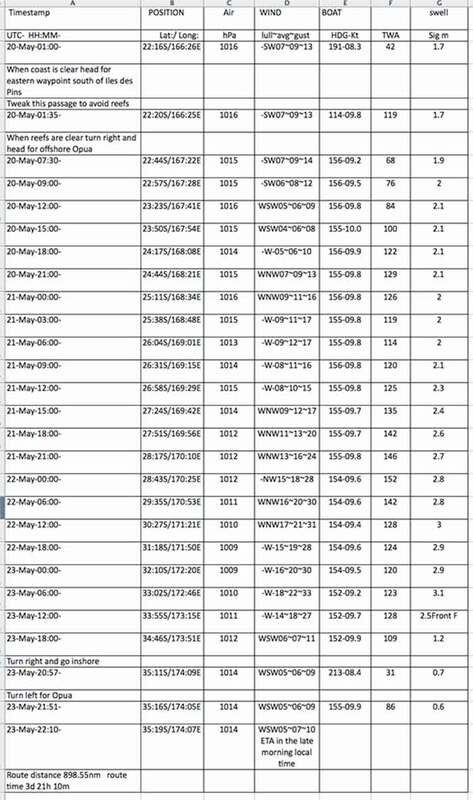 As we are re-checking our weight, balance, drag, and power numbers for the FPB 78, four recent equinoctial gale season ocean passages with FPB 64s in the South Pacific have provided us with a new batch of excellent real world data. We thought you might like to see some of the numbers. This is the first in a series of very detailed passage posts over the next few days, each of which is a combination of the Owners’ comments and ours. We know from long experience that 9.5 to 9.75 knots is a magic number. If you can average this, day in and day out, you can avoid really dangerous, if not unpleasant conditions, with a dose of luck, and judicious timing. And faster is even better. Speed reduces passage time, allows more flexibility in weather tactics, makes stabilizer systems more effective, and is more fun. Directly related to speed is range under power: taking into account sea state, how the yacht handles sea state, including windage, and allowing a fudge factor for safety. If your fuel burn is high and tank capacity low, then you are forced to slow down. This reduces stabilizer effectiveness and increases exposure to weather risks. Equally important in the speed equation is the physical capability of the yacht to absorb what may be a punishing sea state, and how the crew fares in these sub optimal conditions. This is where layout, a sea kindly hull, and details like hand and fiddle rails, position of sleeping and watch keeping stations and even seat belts come into play. We hear a lot about weather forecasting, modern routing, and the use of private forecasters. These are wonderful tools, but those who put their faith here hoping this will keep them out of harm’s way should investigate further. Simply put, the best forecasters, working with the very latest models, make mistakes – all of them. Weather patterns change once you have departed, and being able to maintain that high average speed is the key to making the best of the changing situation. In the end, all design factors come into play in the performance equation. It starts with hull shape, interior volume and where it is positioned relative to the motion centers, goes on through weight distribution, into the engine room and the efficiency of the drive line, through to noise, vibration, and motion under way. In the examples that follow in this series of passages you will see all of these factors at play, and hear from these voyagers just how well the weather forecasting is, or is not, working. Mixed in are compelling comments on average speed, fuel burn, and life aboard an FPB crossing the Tasman Sea and South Pacific ocean, with a slew of gales enlivening the contest. Before we get into the projections for the FPB 78, let’s have a look at what we calculated for the FPB 64, and then what we have seen in an ocean crossing context. We will start with this table from a post several years ago, where we interpolated from smooth water to what we’d expect in an ocean crossing context. This table includes allowances for hydraulics, DC power generation, and adverse ambient conditions. At 9.7 knots we are indicating five US gallons/19L of diesel per hour plus hydraulic and electrical loads, or a total of 5.7 USg/21.57L per hour, all things considered. This is a long post, filled with details from four different FPB 64s, on long South Pacific passages. We have a great deal of data to share, from which there are many lessons to learn. Our owners have been generous with their time, and their permission to share their comments, for which we are grateful. In addition, you will find quite a bit of detailed weather information, some from the FPB 64 crews, and quite a bit from South Pacific weather routing expert Bob McDavitt. Before you get into the details we thought a short recap of what the boats encountered would be of interest. Three crew aboard (owners and their daughter). Noumea, New Caledonia to Bay Of Islands, New Zealand. Fuel burn 5.2/5.4 US gallons per hour. Engine run at 1750/1900 RPM, at 47% to 52% indicated load. Combination of down wind, beam, and head winds and seas. Major adverse ocean current for part of the passage. Key weather factors – narrow window, six hours, to get around Cape Reinga, New Zealand otherwise caught in an area of breaking seas and storm force winds. With constant updating from Bob McDavitt, and the crew pushing themselves and the boat hard, trip made without incident. Note: major differences in weather model prediction over the three plus days of the passage. Three crew aboard (owner, one friend, and professional crew). Whangerie, New Zealand to Papeete, Tahiti. Engine turning 1650 RPM for the trip. Fuel burn 5.76 US gallons per hour. Combination of beam and head winds and seas, very little down wind. Weather models seldom accurate. Left on leading edge of high pressure. Several moderate localized gales along the way, nothing major. Four crew aboard (owners and another couple, former trawler owners all). Whangerie, New Zealand to Latoka, Fiji. Combination of down wind, beam, and head winds and seas. Breeze to mid 30 knot range, seas 15/20 feet in parts of the passage. Key weather factors – potentially dangerous storm developed on models after departure, back tracked to assess, then headed west of track to gain distance on developing storm system. Another blow coming up the Tasman Sea, chasing them, made it prudent to keep pressing. Bay of Islands, New Zealand to Tongatapu, Tonga. Mainly down wind, good surfing. Did not like developing weather scenario after departure and returned to New Zealand. Left several days later and had lovely trip. Key weather factors – Even the use of two expert weather routers did not prevent mistakes from being made (based on confusing models). With the preamble behind us lets head offshore. We start this series of posts with the most difficult of the recent passages, with FPB 64-6 Gray Wolf in New Caledonia. Michael, Liza, and Georgie Dicks are heading back to New Zealand from Noumea. They have had a short shakedown cruise to the tropics, and now need to return for a work sojourn. Heading back to New Zealand is tougher than leaving, as you are on a collision course with the weather coming at you up the Tasman Sea. The Dicks’ choices are limited by schedule. As an airline captain and experienced sailors, Michael and Liza know the difficulties they face, but there is a schedule. They cannot afford to wait for the perfect window, and they are doing this in the wrong season. The Dicks are using weather guru Bob McDavitt (metbob.com) for routing. When Bob sees a brief opportunity to squeeze between systems, he gives the Dicks a hasty call, and then they are off. Both Bob McDavitt and the Dicks understand the risks that are involved – and they are substantial. They have to average close to ten knots, or they are going to get hammered, really hammered by difficult seas and storm force winds. May 24 – Sitting here in the middle of the night, trying to make time fly by. Just like being in the aircraft halfway across the Pacific. Only thing then is you have some lovely thing bring you a coffee or something to eat when you want and it’s not often you are riding a bucking bronco!! Anyway all is good here and we do have great food still on passage. Winds have got up a bit and now from the North occasionally 25kts so getting closer to the front. Seas haven’t changed too much more but we are often up to 14Kts now down waves and it’s started raining. Trying to maintain an average of 10 kts to make Opua early PM Monday if possible, but we shall arrive when we arrive. 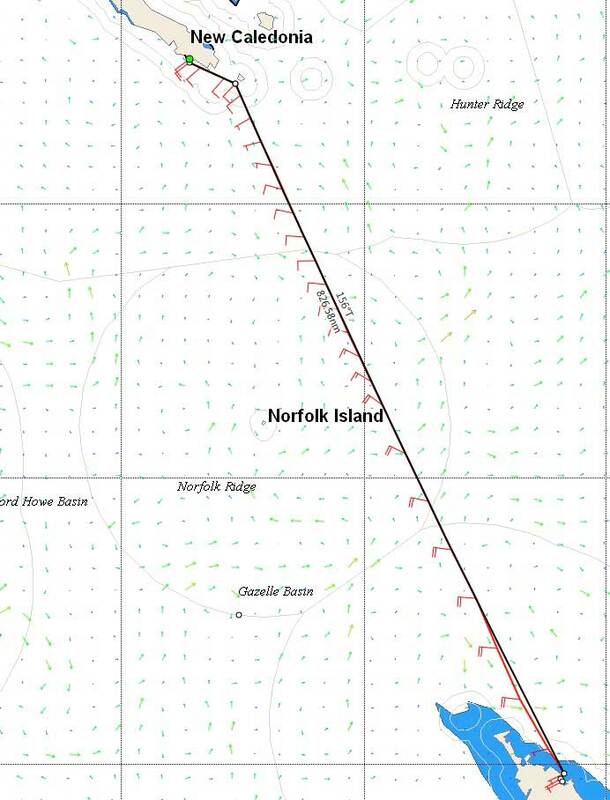 We are running ahead of Bob’s routing, 1200Z position was 27S 168 16 E.Course 145M, Speed 10 kts, pressure at 1200Z 1012. AP settings I haven’t changed but it is not quite as tight on the heading as before, so may experiment with increasing gain a couple of notches. Thanks for all your words regarding our passage, but of course it could all have turned out very differently with a little poor luck as there was only a small margin of error, and I have to say that although we had very comfortable and easy conditions for really the whole way bar about 5 hours off cape Reinga, I was watching developments very very carefully at the NZ end and did not feel particularly comfortable with the alternate options if speeds of lows and fronts changed. This was why we didn’t linger and kept up the revs and SOG even when against the current which knocked us back to around 8 kts for a time. We ran then at just under 2000rpm for several hours until the current relented. A few statistics from the voyage and the month away as a whole. Return journey, Noumea-Opua was 880 nm, time 90hrs, average SOG 9.8Kts. Fuel used 2300L/25l/Hr FOB at start for weight calculations 8200l, 2950fwd, 3800aft,rest in wing tanks. Water at start 5500l, 3300fwd, 2200aft. We did not make any water on passage and used water from fwd tank on passage and fuel used was 1500l from fwd tank, 800l from aft tank. Overall since we left NZ back on 27th April we used 4500l fuel and used 234hrs on the engine and 62 hrs on generator. The two passages used a total fuel of 4000l and 202hrs giving average fuel burn of 20l/hr over the roughly 2000nm. Not sure what the generator uses but assuming 3 l/h that leaves 300l for the other 30hrs on the engine whilst in New Caledonia, and adding in Kabola use as we used this for hot water more than running the generator and using the AC heaters. I think 20L/hr is pretty much in the ballpark isn’t it, although as you see the return trip did gobble the fuel and puts the figures slightly askew. From our log on the southbound trip we ran 80% of the time at 1850rpm, load around 52%, some time at 1900,58% and around 1750rpm at the beginning 47%. Oil pressures stayed constant throughout at 48psi and engine water temps between 86 and 88 degrees C. Sorry I work in C.
You will see that [Bob McDavitt] suggested we head south on 160T for the first couple of days to prepare for the wind and swell change after the passage of one front. Whilst I was fully accepting of this strategy, left to my own devices I probably would have headed more closely to the rhumbl ine as it would have kept us 40+ miles more to the East of the lows and fronts if they had matured earlier than forecast. We followed his advice for the first two days but then turned earlier for the direct route as the wind came in sooner from the SW and with a track of around 130M(147T). I couldn’t see that this was going to be much of an issue. Of course the old thoughts of routing in a sailboat still apply to a certain extent as you want the smoothest ride, and do not want to bash to windward even if you can in this boat. I will forward a couple of the emails I received from Bob on to you for your thoughts. You will see that actually we had a good window but there was so much going on as we got south with gales everywhere virtually, except where we were headed and at our position so it did work out well in hindsight. Now for a few thoughts on the trip from an ex-sailor’s perspective. The journey of 900nm would normally have been planned at 6 kts in our old yacht, thus making it a 6 day affair and needing a larger weather window to make this passage in winter into New Zealand. We had a fuel range of around 600nm so the planning is that much more difficult on the old boat, as you are looking for wind but not too much and of course in the best direction. The forecast we left in would not have been doable as winds were generally light and we would have taken much longer than 6 days ,even with motoring and the risk of encountering nasty weather would have risen substantially as we approached New Zealand. Having said that, of course there are many yachts making the same journey every year from the tropics but generally arriving late spring when weather is beginning to improve and frontal systems may be a little less frequent. Knowing that with our powerful engine and easily driven hull we could make this passage in 4 days took a lot of pressure off the weather. However we still needed to speed up to beat the large 8+m swells coming north up the Tasman towards us and avoid the two 40+kt gales that occurred either side of our arrival into Opua. The window for arrival was not large. Weather on passage itself was benign, seas less than 2.5m and light winds but lots of rain and cold, grey skies. Our old yacht had a sprayhood and bimini but we would have been sitting out in the wet and cold everyday. Nights are longer than days at this latitude and time of year so we remarked on several occasions how miserable it would have been sitting in the cockpit. On the other hand watches, especially at night on our FPB are generally very comfortable affairs. A warm cozy ambiance, comfortable helm chair or settee and with the benefit of large displays showing radar, with guard alarm set, Flir camera showing outside as if it were broad daylight and engine camera cycling. Frequent weather downloads from the VSAT or pactor 4 modem through the HF and good WX fax downloads directly onto the Furuno going on quietly in the background all help to make the passage go smoothly. With three on board we ran 3hrs on, 6hrs off watches and made an engine room inspection at each handover. The aft deck floodlight made a visual inspection of the seas which were mostly following easy to do at night from behind the closed main door. The pleasure in Grey Wolf is that there is virtually no rolling with the active stabilisers, but it is noisier than moving along at night under sail. For one we are moving quicker through the water at 10+kts for much of the time and the engine revs vary (as they do on a sailboat) when accelerating and then slowing on following waves making sleep sometimes not as easy as on a sailboat under sail. On an FPB versus a sailboat it is very easy to become more detached from the surrounding environment and somehow have less awareness of the wind and waves if one is not out in the open and as close to the water. Being on the fly bridge, higher up though has proved to provide a perfect vantage point to see wildlife such as dolphins, whales, sharks etc. There are still tasks to perform on a power driven vessel just as on a yacht, moving the boom lines a few inches everyday to prevent chafe and making deck checks etc, but not having the constant trimming of sails especially when squalls and showers come through reduces the stress and workload levels enormously. In fact I almost looked forward to a downpour to wash the boat and provide a bit of interest. We have had the fly bridge enclosed with clear screens and this has proved to be an enormous benefit, adding to our liveable space and allowing us to get out into the fresh air, as you do miss this aspect at times if you remain inside. As all the hatches were closed down we ran one saloon air con the whole passage keeping temp constant at 19 degrees and reducing any humidity when cooking etc, and making sleep much more comfortable. On a sailboat, in the ideal world you are sailing but thus short of power so having all this energy from the large engine alternators makes living aboard on passage much easier and more comfortable. At the end of the day this is still a small vessel so does move around in open seas so there will always be an element of discomfort when offshore. The Dicks’ fuel burn, 20 liters/5,4 US gallons per hour for the entire cruise, sounds about right as an average. Based on how hard they were pushing heading south, we’d expect that leg to have run as much as 15 to 18% higher than the overall average. Situation and comments: A voyage departure on Monday is now looking better than the original data was suggesting, and departures on any other day this week are not looking good. So here’s the voyage forecast for you to decide upon. This voyage arrive in Opua as a slack Low passes by, so misses the strong winds that are over NZ on Wednesday. I am using www.expeditionmarine.com for routing with latest Oceanic and GFS data output. VPP is for motoring up to 9.8 Kt. DISCLAIMER: weather is a mix of pattern and chaos. The real world unravels away from the model output shown here. Computer data does NOT do well near a coast or in a trough. In a convergence zone computer gives averaged-out light winds, but occasional squalls can deliver 30 knots for 30 minutes. If your baro strays away from target pressure more than 5 hPa the forecast needs updating [our emphasis-SetSail]. DECODE: Time HH:MM is hours and minutes in UTC. Lat and Long are in degrees and minutes. hPa is barometer in hPa, Wind is compass octant coming FROM and lull~avg~gust is speed range in knots. HDG@kt is boat heading to in degrees TRUE and speed in knots. TWA is the angle between the wind and the boat heading, minus for wind on port. Waves are significant wave height in metres=average of top third, or are exceeded around once in 7 waves or once a minute. Add 50% to get the occasional wave which occurs or is exceeded around once every 10 minutes. Each turning point or way point is introduced with a line of text; the other lines are extras to fill in the in-betweens. Departing Noumea around local noon Monday= 200100UTC, go out to sea along 191 deg true. We have included this first forecast, even though it was not acted on, to give you an idea of the range of weather that is to be expected in many parts of world during the change of seasons when the weather is often most unstable. This is a very benign forecast. Sure, the wind is on the bow quarter, and there are those eight to twelve foot seas, but for the FPB 64 this is a relatively easy passage. Note Bob’s forecast of the passage time, which works out to a realistic 9.65 knots. Now the forecast on which they actually departed. Saturday…Winds may get a little stronger than computed 20 knots during the front and it is very likely to be a dull and wet day. Then the voyage encounters the back of the low and its southerly winds around 26 1200 UTC (Sunday night local). These head winds are expected last around 12 hours up to 15 averaged knots. I have deliberately inserted a way point west of the direct route so that the voyage does not encounter these winds head on, but at an angle, to make them more comfortable. The way point takes you closer to Norfolk Island during local Sunday afternoon- if you want you can divert further and take a look, but I’d say stay away and avoid the place– seas are rougher over sea mounts. However it is nice to have a halfway house if needed. Soon after the voyage arrives in Opua a bigger front is expected followed by very strong and squally southerlies — so it is imperative that you don’t stop for a few hours fishing along the way. Bob has shown the Dicks’ average speed dropping and the passage taking an additional eight hours. This is a conservative assumption on his part. However, Grey Wolf has the power to maintain a faster speed, if required. Given the forecast wind direction this is not too difficult, the only stickler being what is bound to be a confused crossing sea state. 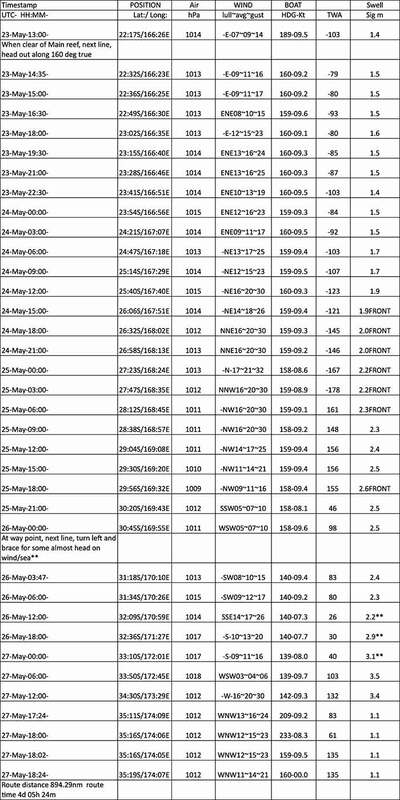 The wind field data below is historic shows the challenge of the gale heading towards them on May 24th. Note the black arrows and their wind feathers above! Thanks for the position report — I’ll take that as at 2230UTC. Yes continue along 146deg Mag to west of direct line. As for the front, well, it will cross our route no matter what we do, so just be prepared for some squalls with it on Saturday from 241800 to 250600UTC. As for the Low, okay this course gets us closer to the centre, but forecast is that winds in the sector of the Low are not strong and should stay moderate, so that’s okay. The advantage of 146deg will be when we do the turn we will avoid taking wind and sea head on after the Low. However we need now to go a little further before turning so this update forecast is a good idea. 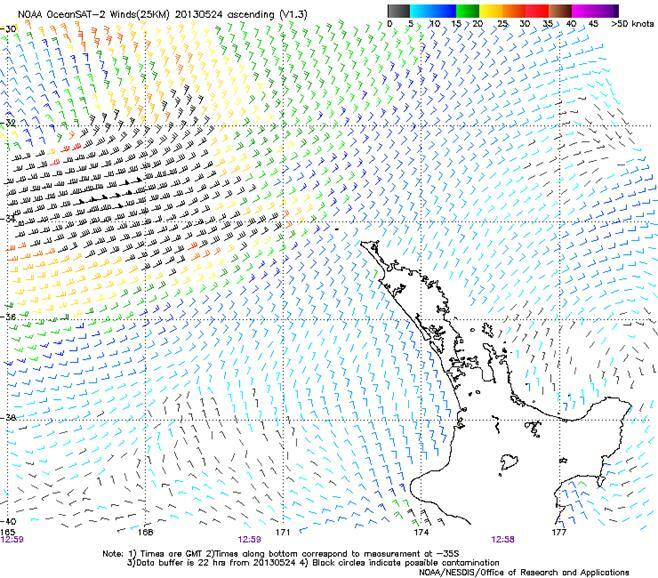 Hmmm Satellite imagery shows your current lull and SW wind is just temporary, the MAIN PART OF THE FRONT is still west of you and travelling east And should finally clear you around 250900UTC 9pm tonight NZ time. Thunderstorms are visible at 30S 161E, that bunch should travel SE. Even after the front there should be NW winds overnight tonight — easing. Anyway all this means that there are not likely to be S or SE head winds to fight after the front anymore. So yes head for Cape Reinga now, and after the rain and confused sea eases, head direct for offshore Opua. That burst of big swells moving into southern ocean is moving faster than the cold front accompanying it! At your pace you should get south of Cape Reinga by 261500UTC, and the big SW swells are expected to exceed 3 significant metres at Cape Reinga from 262100UTC. By then you should be in the lee of the North Island east coast — but yes there is only 6 hours in it, so no dilly dally please. All looking to go as forecast — the 3metre swells from southern ocean are expected to reach Cape Reinga round 26 2100=9am Monday. And there are King Tides today. And surface current should be with you and worth an extra knot from 33 to 34S. The second forecast was issued on 23 May for a last thing on Thursday departure— this was done to keep the crew happy (don’t depart port on a Friday). Sorry there is no map this time, all text for a sailmail address. We expected 20 gust 30 knots plus a little more with the front and a build up to around 3.5 significant metres of swell after the front. An update was sent on Friday 24 May beefing the front winds to around 25 gusts 35 knots and swinging a course in readiness for possible southwest/southerly winds. Another update was issued on Saturday, expecting more of the front to come. Brief updates were sent later on Saturday and again on Sunday to fine tune the approach to northern NZ (a day of King Tides). Three and a half meter/twelve foot swells in the open ocean are one thing. But in the area approaching Cape Reinga, with a shallow sea bottom, confusing currents, on top of a large tidal range and stronger than normal currents, they could easily become confused breakers, and that is entirely something else. So the Dicks are faced with a dilemma. Slow down, let these swells pass, but be exposed to a deepening low, really powerful winds and associated seas, or get into the lee of the land before the excitement – swells and/or weather system – arrive. No big deal so long as they can maintain their average cruising speed. Note the updates after departure changing the nature of the expected conditions, and the need to make haste. This is not abnormal. Now think back over the passage, and Mike’s previous comments about pushing hard, and threading the needle. When we emphasize speed as a safety and comfort factor, a lot of folks are going disagree with us, and say it is not that big a deal. How much can a small change in speed mean, anyway? Consider what just a half a knot difference in speed, dropping back to 9.3 knots, over this passage would have made. That is six hours. Or a full knot back to 8.8 knots, not much in the overall scheme of things, just 12 hours. Would you care to be aboard on this passage for that additional six or twelve hours at the end? Which brings up a final point, and then we’ll get off the soap box (for today). Among other things, speed is a function of how heavily the boat is loaded, the cleanliness of propeller, and bottom condition. In these types of passages, making sure all the speed producing factors are in your favor is prudent. In the next section we’ll make the trip in the other direction, from New Zealand to Fiji. Eventually we are going to tie all of this back to the FPB 78, and what this data tells us about its performance projections. Another example lies with FPB 64-3 Iron Lady last month. Owner Pete Rossin reported back as they cruised along what ended up being close to a great circle route from Whangarei, New Zealand to Papeete, Tahiti. This is a 2300 to 2500 nautical mile passage depending on weather routing (and the lovely photo of Cook’s Bay in Moorea that Pete sent us is just one of the many rewards for this voyage). The high pressure systems typically move at around 15 knots, and with ten knots of boat speed you can almost ride one system for the passage, reducing the number of gales en route. We’ll let Pete fill you in on the conditions, so you can quantify the average impediments to optimum when he reports his fuel burn at the end. May 19 – Currently 460 out of Whangarei on the great circle route to Tahiti. Winds have generally been from the WNW to the NW at 20 to 25 knots which puts things on our beam or slightly aft of. Leaving Whangarei we caught the tail end of a dying northerly sea at 3 to 4 meters but fairly long period – boat handled it with aplomb. Since, seas have averaged roughly 2.0 to 2.5 meters. No real crashing in to it but a good bit of motion on occasion with the wind shifts. Strategy has been exactly as you suggested – ride the southern edge of highs and then stay north of the frequent lows. We have been fortunate and now after one more frontal passage tomorrow with 25 to 30 in it, winds should gradually die out until we hit the trades. As you know, the first three or four days are critical when departing NZ. As to numbers, boat is decidedly quieter with the 4 blade. We are getting a solid 10 knots at 1650. Engine load is running 47 to 50% unless we are pushing the alternators and then we might see up to 55%. Coolant temps seem a bit higher then before – we historically saw 178 and now we see 183 and up to 186 when we are pushing the inverters hard. Still well within limits. Fuel burn is 51 to 5.7 GPH and the meters tell us that that is 1.8 to 2.0 NM per gallon. Daily runs have been very close to 240 miles per day average, with some days more and some days less depending on sea state and current. Have stayed in the master cabin throughout – very comfortable. May 20 – Current distance out of Whangarei is 706 nautical, yielding an average daily run just shy of 240 nautical or 10 knots an hour. Engine revs 1650, fuel burn about 5.7 GPH with Iron Lady heavy on fuel and water. COG is 48 degrees magnetic. Barometer is 1017 and rising and winds are from the west at 15 to 20 knots, putting the wind on our stern quarter. Seas are running about 2 to 2.5 meters and Iron Lady is getting the occasional surf. A building 1007 millibar low beneath us is heading southeast and a 1025 millibar high to our northeast are providing our weather and winds. Last night’s heavy showers have given way to clear blue skies, but a stalled front remains in the area. Last night’s prog from ZKFL showed us converging with the centre of the low on its southern side, which would have put the winds in our face at 20 to 30 knots. We gave some thought to some northing today to avoid that if the low continued to track as forecast. After reviewing today’s information, we are maintaining our voyage plan and proceeding on the great circle route between Wangharei and Papeete as the low is clearly beneath us and a big high is above us. ZKFL got both the speed and direction of the track wrong to our benefit. Just as well as northing now would have put us into the present winds and seas and put the southeast trades more on our bow as we approach Tahiti. Sometimes it is “pay me now or pay me later” but it has all worked out so far. May 22 – 1200 position is 18 S 164 51 W. COG 046. Nautical noon to noon run 228, or 9.5 knots average. Barometer 1019 steady, winds NW 20 to 25. Seas 2 to 3 meters from the NW and confused. Sky conditions overcast with heavy rain showers about. Distance travels since Whangarei roughly 1175 nautical miles – over halfway to Papeete. We have found ourselves collocated with the convergence area between two high pressure systems that spawn lows that overtake us and then pass southward. The highs are moving at the same relative speed as us, so are stuck in the middle so to speak. Last night brought torrential downpours and heavy lightening as the last low and front came thru. In one watch, the wind backed thru 360 degrees and returned to northwest at 25 knots. With the wind shifts, the sea state is composed of two competing wave trains. When they are out of phase, they tend to cancel each other. When they are in phase, they are additive, and short coupled peaky waves are the result. We are keeping the waves on Iron Lady’s shoulder (roughly 30 degrees off her port bow) and she is very comfortable with that. Steve [crew on Iron Lady] says she is the best behaved boat on that point of sale that he has ever been on – power or sail. May 23 – Today the seas and winds were gentle from the WNW aft of the beam, and the chaotic seas of the last few days are behind us. Iron Lady was doing her usual 9.6 to 10 knots but it felt like we were flying thru space and time. The whole experience was magical. May 25 – Yesterday’s noon to noon run was 233 nautical, which translates to a 9.7 knot average for the period. Distance traveled as of 0800 today is 1815 nautical. Current weather is scattered clouds, barometer 1020, winds SSE at 16 and waves 1.5 meter from the SE. We are on the backside of an occluded front which was to produce 25 to 30 knots from the south, but there doesn’t appear to be anyway that is going to happen. We are on the north eastern edge of a high pressure system that is moving slowly, so our next wind shift will probably be the southeast trades. Engine revs still at 1650 and other key parameters remain unchanged. May 26 – Since last night, it has been blowing 25 to 35 from the east southeast. We picked up the southeast trade winds yesterday afternoon at at steady 20 knots. Iron Lady made light work of the waves on her beam. As forecast, an occluded front went thru last evening – no rain, but it did bring with it more southeasterly flow to reinforce the trades. Overnight,winds came up from the high 20’s to 35 knots from the east southeast. The seas were not large by our standards – up to 4 meters – but they were very steep and short coupled, which made for a sporty ride overnight. The aft staterooms were fine but I, being stubborn, stayed up in the master. It was like sleeping in a washing machine so not my best night. Will grab extra sleep during the day today. This brings up a point however. The FPB has the speed to avoid such encounters by altering course in advance. Being realistic, however, there is no way you are going to get a perfect 11 day weather window for a 2200 mile jaunt across the Pacific. In terms of forecasts, 30 hours is about as good as it gets with some accuracy. That said, there are simply times it is best to live with what you get and push on as opposed to evasive maneuvers. From our perspective continuing on on the great circle route for an early arrival is worth 12 hours of being a little uncomfortable. Iron Lady and her crew made their landfall as projected, cleared into Papeete, and are now enjoying the wonders of French Polynesia . Mileage was 2251 dock to dock. Fuel burn was 5060 liters. Revs were 1650. Time was 232 hours after adjusting for dateline and time zone changes. Average speed of 9.7 knots. For 16 hours or so we did slow down to make landfall in daylight and slack water, so real average at normal cruise was a bit higher. Also, we lost about half a knot to current on average. Fuel burn for this passage, with its variety of winds and waves, plus hydraulic and electrical power requirements, turns out to be 21.8 liters/5.76 gallons per hour. Note that this fuel burn is based on filled tank to filled tank, rather than interpreting gauges. In other words, we consider this accurate. In terms of range, given the 3400 US gallons of fuel, it is in the neighborhood of 5700 nautical miles. You can pick up with Iron Lady’s travels on their website. Pete has some great photos of the cruising life in paradise (but we think the fish images have been Photoshopped – they couldn’t be that big, could they?). A couple of items here are worthy of note. First, the weather forecasts were seldom precise. But by watching their local conditions and using their boat speed and range, Pete and his crew were able to figure out what was going on. Wind and wave patterns were such that for a majority of the voyage they will have added to drag, increased fuel burn, and reduced range. We consider this a realistic enough hit on performance from these negatives to use this as a baseline for most calculations. We should also point out that with patience picking the date of departure – which means nobody flying in to meet the boat in French Polynesia – it is possible to make this trip almost all a downwind passage. Head west to the Austral Islands with a southwesterly flow on your starboard aft quarter, then reach across the southeast trades from Raivavai to Papeete, with the breeze on the…starboard aft quarter. For a video of our sailing passage from New Zealand to Raivavai in the Austral Islands click here. For some impressive videos of Iron Lady in heavy going click here. 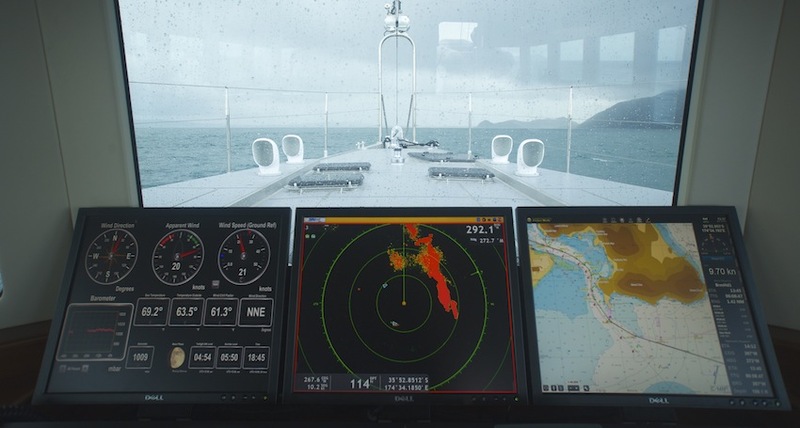 This third real world speed and cruising range section takes us from New Zealand to Fiji aboard FPB 64-7, Buffalo Nickel. Once underway, Val and Stan Creighton will deal with a potentially dangerous storm between their position and New Zealand off their stern, with another coming up from the south behind them within a day or so. This trip runs about 1100 nautical miles, and can be either extremely difficult or a piece of cake. Generally speaking, with the weather chasing you from the Tasman Sea, you will not encounter as much weather as when heading into the oncoming systems. However, you can have rapidly developing unpleasantness which is the result of tropical and extra tropical weather features combining. These are hard to predict with accuracy and can be extremely dangerous. If you have patience, and wait until the overall weather pattern is at its best, by the time you are halfway to the Islands-48 hours out of New Zealand – you will normally be clear of the “bomb zone”, as we like to call it. Magic speed—well that’s a good question. Since most weather systems in the mid-latitudes tend to move at around 240 to 300 mpd, then a boat at that speed has the unique feature to be able to stay at the same part of the weather system and ‘ride-it’ as it moves. Anything faster or slower than the movement of the weather system will shift around the weather system and thus change wind angle and swell. Weather systems in the tropics may be further apart, separated by long stretches of useful trade winds— but even in the tropics the movement of a weather system once it has formed is around 240 mpd. So best speed to aim for is around 260 mod (240 mpd +~10%) (Beowulf)–any faster may be a waste. Now let’s go to sea with Val and Stan’s comments from their website, interspersed with the routing data being sent them by Bob McDavitt. : BuffaloNickelBlog.com. Pressure reading for your barometer at Whangarei at 11am Wednesday 1026. I’ve assumed you are heading for Navula Passage, but if you are going somewhere else in Fiji the forecast is going to be much the same. High in Tasman Sea is spreading east along around 33S and should slowly cross North Island between Thursday and Sunday 2 June. Next front for Northland is expected on Mon 3 July. 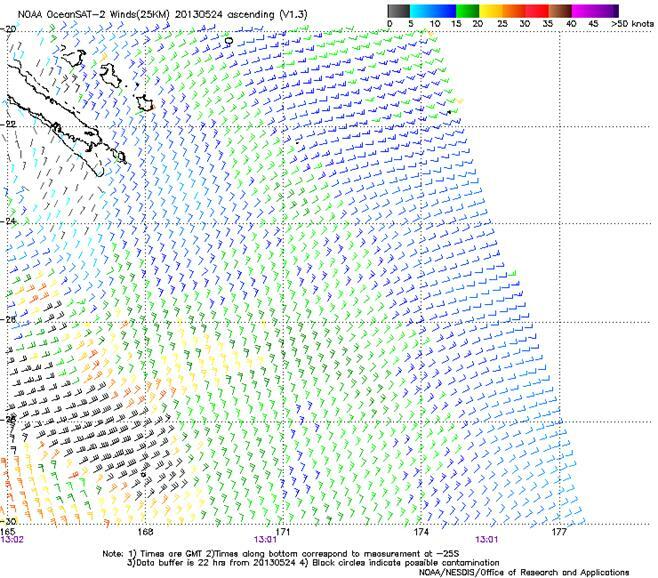 A Low is expected to form over Tonga on Sat 1 June and moving quickly off to the SE. This is likely to maintain 15 to 20kt SE winds on your voyage on Friday and Saturday, as well as around 3 metres near 23S for your voyage. After the Low moves away, winds on the voyage and over Fiji ease away. South Pacific Convergence zone is likely to return to western Fiji on Tuesday 4 June, but is a weak state– good for isolated afternoon showers. Thanks for your position report. There is a subtropical jetstream between you and Fiji. No LOW yet, no sign of it, but the Low that is expected to form from this is now calculated to form near 23S 177E by 01June 0000UTC/noon Saturday local time. This is later and further west than originally expected. It should deepen and move SE with gales near its centre and strong winds out to about 29S by 01 1200UTC. You are already going north, good. And I have added some waypoints to turn you WNW to avoid these strong winds. Then you can go northeast again in SE/S winds —along that leg from 010600 to 020600UTC some left over 4 metre swells are expected, so take it carefully. Then light winds on Sunday. Then, from Mon to Wed, northerly head winds. Front on Wednesday near 20 South, then southerly winds to Fiji. So update avoids the strong winds but may be somewhat uncomfortable with significant waves up to 3.7 metres. No problems if you return to NZ to wait this out BUT next departure may not be until Thu/Fri 6/7 June. Let me know what you decide. Thanks for position report. All looking OK– latest satellite imagery shows the low is forming further east than computed, so it is further away. With this breaking sea, maybe slow down to 8.5 knots for a smoother ride. way point as it is a good insurance policy just in case that Low near Fiji forms something further west-and that might still happen. So at the way point turn right and head for Navula passage. side rather than as a head-sea. Subtle, and you can ignore those way points if you like. 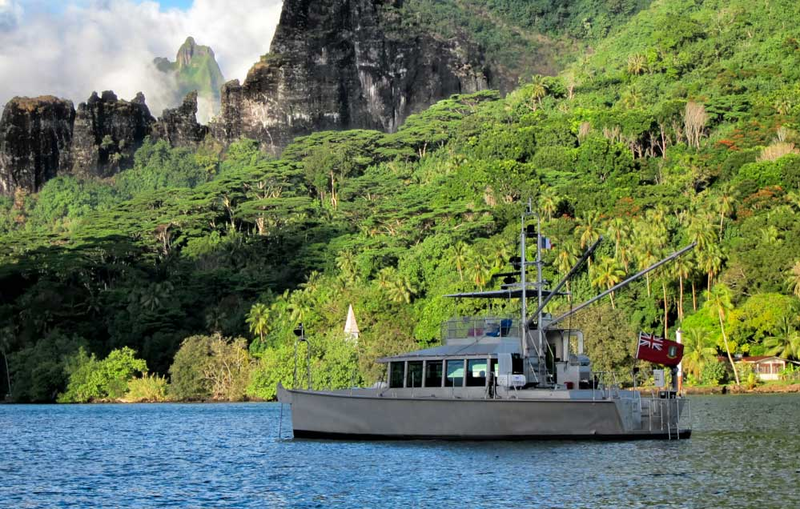 We are just about 24 hours out from our departure from Marsden Cove toward Fiji. The past day has been an ideal one from the cruising power boat perspective: very light winds, comfortable slow-rolling seas, no rain, running at nearly 10 knots. The four of us had a marvelous meal last night, pan-seared New Zealand gurnard (a mild, sweet white-fleshed fish), broccoli, some simply boiled potatoes with a bit of mint. Then we watched a movie in plush comfort, and chatted with a few of the sailboats we were overtaking who had left a day earlier than we had but travel at half our speed. Skies are blue and the sun is shining as I write this, barely a cloud to be seen. So, are you hearing the ‘Jaws’ theme in the background, ever so slowly increasing in volume? There was a low pressure system developing near Fiji at the time of our departure. It was not expected to be much of a low, and was anticipated to move well to the southeast before we arrived in that area. We have been keeping a close eye on it, of course. This morning we didn’t like what we saw on the GRIB files we use to visualize and predict regional weather patterns. It was looking like this low would be more of a problem than we had hoped. Just as we re-routed our course to carry us further west, keeping us on the west (best) side of the weather, and delaying our arrival to it besides, we started getting e-mails from our weather routers, and multiple calls on our satellite phone. We considered some options, mainly either heading due west and slowing down while we wait for the system to make its way in the other direction like a good little storm; or, since we are only about 18 hours from the Bay of Islands in New Zealand, making an about face. Then we learned that there’s another system headed across the Tasman Sea, so heading west could potentially get us crunched in between, where we’d get hammered anyway. We are truly concerned about some of the sailboats north of us, because there definitely could be some problems over the next day or so. We have fingers crossed on their behalf. But we decided to about-face. The four of us are referring to ourselves as ‘Buffalo Chicken.’ Hope that moniker doesn’t stick, but to our concerned friends who have been watching this weather become more and more ominous, know that we are stampeding home. Just ’cause we can. Hummus-crusted chicken with rosemary and lemon tonight, side of butternut squash. And we’ve decided to avoid Tarantino this evening, opt for something sweet and escapist instead. May 31- Passage New Zealand to Fiji, Day 1. No, really. Those of you watching our SPOT tracker will see we have been having a merry time exploring an unremarkable patch of ocean. But hey, we were told it would be good to put more hours on our engine. Turns out we did that. After gathering as much info as we could and the Stans poring over our options, we have decided to alter course again. We have chosen a route that takes us fairly far northwest in the direction of New Caledonia, keeping us to the west of the big low. After it makes its way southeast we can make a right turn and angle back toward Fiji. We are in for some uncomfortable seas of the following variety at some point, but with a watchful eye on both systems as they develop, we should be able to stay safe and get to Fiji [Val’s photo above from their passage – looks like good surfing conditions]. We’ll update with our conditions tomorrow. Thanks for the report – computed waves are around 4m and actual waves around 5-6m at 8sec. Winds are now easing as Low has formed and is moving away. Swell is expected to be at its peak now and ease from 020900UTC. Try turning direct to Navula passage from 020730UTC (after sunset). and a front from around 040000 to 040900UTC. But these are no longer expected to be significant enough to warrant a deviation. This should have been the day we made our landfall in Lautoka. But with all the scurrying hither and yon avoiding nasty weather, we lost a day. The great news is conditions have been lovely last night and especially today. Winds: light and variable, NW, expected to continue clocking around us to end up SE. To summarize our weather conundrum: we departed Marsden Cove, NZ on Thursday, knowing there was a low pressure system developing south of Fiji. This system was expected to be relatively weak, migrate SE and not be a factor for us by the time we arrived in the neighborhood. After we left, we downloaded a weather file update known as a GRIB file. It showed the low developing much stronger than anticipated, and also further west. This could be a serious problem for us if we ended up to the east of it as it made its way southeast. It could mean truly awful winds and seas hitting us head-on, which is no fun in a best-case and truly dangerous in a worst-case scenario. We initially about-faced to head back toward Opua, NZ, but then thought better of it. We diverted northwest instead, to stay on the ‘correct’ side of the low [Buffalo Nickel’s track from Val and Stan’s website above]. This put the wind and seas more behind us, so although we had winds in the high 30′s and big seas they were manageable. We were able to do this because we have a boat that moves fast enough to employ such tactics when needed. Several slower sailboats got caught out southeast of this low, and had the same 18 foot seas and 40 knots of wind right on their noses. They sounded truly exhausted when we heard them on the SSB radio net at the end of the day. But before long we had to head northeast, or risk getting caught ahead of a different low coming from the Tasman Sea south of us. In between these two unsettled pieces of ocean was a safe zone which we succeeded in following, arcing around to the west instead of taking our bee-line. This left us exposed to less comfortable seas for a day or so… we set our heading to take the seas off our bow, but there were plenty of big waves hitting us on our starboard beam thrown into the mix. The four of us were astounded at how gracefully Buffalo Nickel handled these various conditions. And being newly acquainted with her, we haven’t even begun to start pushing buttons and varying settings on our stabilizers, which, who knows, could have made our ride even more tolerable in those hours. We cruised Costa Rica and Panama in our fiberglass Selene trawler, cruising grounds known for having dangerous logs, huge trees and other debris floating around, and managed never to hit more than a twig though we saw plenty out there. Now here we are on a passage through a big ‘clean’ ocean, no debris in sight. And we’ve been hit by two logs. The second one was more like a sequoia. Nearly submerged, covered with barnacles. Hit our starboard side just ahead of the house with a loud bang, then whipped around and smacked us amidships so hard it sounded like a grenade explosion, sending a huge volume of water up past the tops of our house windows. All four of us have white hair now as a result, which is a bummer as I’d just had my roots done. But the Stans checked the stabilizer fin on that side for presence (!) and function, it seems fine, and no vibration at all in the propeller. With a hull construction like ours, it’s not the hull that one needs to worry about so much as all the stuff sticking out of it. But so far as we can tell, no harm done. So we are happy sailors. Skies are nearly clear, temp outside is a comfy 77 and water temp has risen to 82. Stan fished yesterday and caught a skipjack, not the ahi I ordered. He had fun all the same, and tonight it’s chicken stir-fry with peanut sauce over sushi rice, after we digest Anchovy Stan’s delicious guacamole. Thanks loads to Stan’s daughter Kristy for posting these blog entries on our behalf. With any luck, we’ll get some internet going right after we make landfall and get some pics up real soon. We made our landfall in Lautoka, on Fiji’s Island of Viti Levu, on Wednesday afternoon, a bit less than 48 hours ago. All my wave pictures from the passage turned out to be rubbish. No surprise I suppose; I only took 250 of them, and my ratio of ‘deletes’ to ‘keepers’ is more like 500:1, on a good day. Current position 30 39S, 172 181E. We are steaming at 9.5kts on a course of 314T towards our waypoint of 29 48S, 171 18E. Wind ESE 25-30, seas on our starboard quarter 10ft+ and fast moving. Boat doing beautifully, crew are happy. Our intent is to continue to thread the needle between these two lows, maintaining our northwesterly course until sunset or shortly thereafter, when we are hoping to be comfortable enough to begin turning northeast toward Fiji. While Buffalo Nickel is cruising along, a group of cruising yachts a little ways to the northeast are being hammered by 40 to 50 knots of wind. The next email is in response to questions we asked and some comments we made about stabilizer and pilot settings. Hi Steve, Initially seas were behind us as we ran off northwest, but then with this low moving around and past us as and as we turned to a northeasterly course, we had some big beamier action and also some confused conditions for awhile. Stabis seem to be working fine, but we do roll once when a big beam sea grabs us (we had some 6 meter seas out here, some of the sailboats caught in it were sounding really exhausted on the net.) Not having had Naiads, or the ComNav for that matter, in the past, we have been reluctant to push buttons on these while underway on our first passage. We’re more focused on getting familiar with how she handles generally. Those Naiads strike us as a fairly sophisticated system which will take some manual reading… something we have not had time for as yet. Settings on the stabis are adaptive mode, at all the default settings. Engine RPM around 1800. We began at 1750, but ended up pushing it up when our sat phone began ringing off the hook with warnings about these 2 lows! And haven’t lowered the RPMs since. Engine load is 49-50%. Boat speed now that conditions are more settled is around 10 kts. But especially during the rougher weather, our speed over ground was really difficult to gauge, mostly due to very frequent sampling by both the NavNet 3D and the Coastal Explorer’s dedicated GPS units. In fact we had been discussing making a call to Deon, see if that can be dampened a bit, filter some of the data sentences or whatever because the wild variations in SOG are distracting and not helpful. We’ve glanced at a couple manuals but haven’t found a way to do that yet. Today, with wind 15 kts on the nose and steady mild seas, no cavitation whatsoever. The conditions where the prop cavitates seem to be: when one of what I call the screaming beamers would pass under us (these were all on our starboard side,) and also at the end of a surf with a quartering sea (also were all starboard qtr) when presumably the sea is overtaking the prop a bit. We look forward to an uneventful run to Fiji from this point, will make landfall tomorrow. As to our friends, yes they were impressed. They loved the way the boat handled the seas, but his reaction was that given what he knew from following your blog etc, he expected the ride to be superior. What struck him on the passage was the speed. I don’t need to tell you, there’s a bit of a myth going on about running speed in the trawler market. 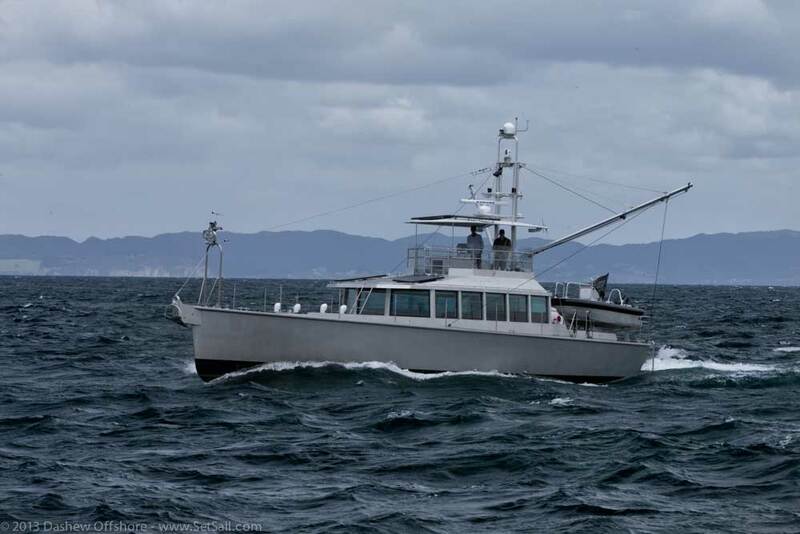 Our 53′ waterline trawler was billed as cruising speed of 10 knots… and a range of 2500 miles. This is typical hype and of course ludicrous. 10 knots is closer to maximum speed; one can easily cruise at 8-8.5 knots if fuel efficiency is not a big priority, and that is comfortable and good for engine loading. 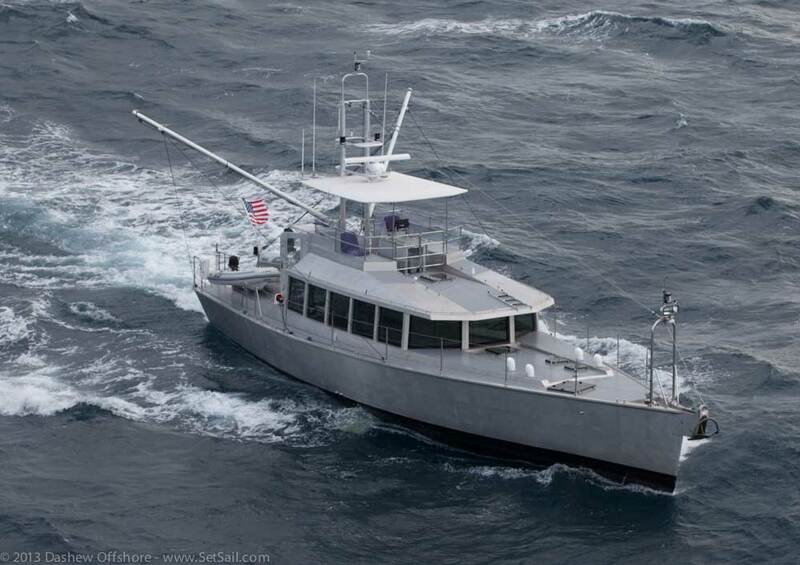 But the 2500+ range applies only at speeds of 5.75-6.5 knots, still leaving zero fuel reserve on a pacific crossing. So in a pacific crossing, for example, you are going very slowly making for a longer passage, with heavy fuel bladders on your deck. And at those speeds, stabilizers don’t work very well so you get to roll more. Add to that the fact you are being too stingy with your fuel to run your generator: on most (but not all) of these boats, air conditioning and/or laundry are generator dependent. Hot, dirty, sweaty, nauseated… let’s see, have I forgotten anything? Oh yeah, also swearing a blue streak because weather you had no ability to avoid is turning to —-t. So for him to see and experience BN plugging along at 10 knots being pretty fuel efficient and able to gallivant all over avoiding unpleasant conditions really hit home with him. We all know the speed/range thing is misrepresented by all these trawler names so it was just surprising for them to realize that we really and truly were going to do our passage at nearly 10 knots and still have plenty of fuel for our season and return passage. Total passage miles was 1473 and total time was 138 hours. I don’t have the fuel consumption, but it was higher than normal, as we have less fuel now than I thought we would have when we got here. For at least two of the days (maybe more), we were running as high as 2000 rpm trying to make tracks to avoid the lows. The miles and time are accurate though, so it looks like we averaged 10.6 knots. We did have big following seas for at least two full days, and our top speed was 14.6 knots with wind aft and to starboard as well. We didn’t try for a record as we were in Chicken Mode on the trip. Couple this speed with enough range, where they can afford to divert for weather, and then resume course to their destination, and you have a mix that allows maximum flexibility in the decision making matrix with weather, or avoidance thereof. Indeed sad about the Nina. We lost Comms with them on June 4th so I’m including the isobars (05 00UTC) and a wind map (04 18UTC) near that time, at this stage Buffalo Nickel was near Fiji. On May 28th when the Buffalo Nickel was planning to go from Whangarei to Fiji the weather pattern was looking OK and the following map was drawn up for a May 29th departure. The main problem with Buffalo Nickel’s voyage was a Low that formed near 23S 177E on 1 June underneath a Jet stream. Shown in map below at 01 0300UTC. Background small arrows are the surface current. Matrix of larger barbs are the winds, coloured according to speed. Shades areas are RAIN. Lines numbered 1008 1012 etc. are isobars and lines labelled 3 4 5 6 etc. enclosed 3 4 5 6 etc. metre waves. Note the squash zone of enhanced wind and swell between the Low and the large High over NZ—shaped just like a banana, and worthy of avoiding. This Low’s formation was NOT picked up by the models until 31st May when Buffalo Nickel was at 32S, so an update forecast was then calculated to take the vessel clockwise around this obstacle as it moved off to the southeast and avoid its worst by staying outside the 1012 hPa isobar. Even so, they encountered 30 knots and 5-6 metre waves with a 8 second period on 2 June. Bob’s comment about the low and its formation not being shown until after departure is not uncommon in the real world. We then asked Bob if the conditions this season were worse than we recalled (or was our memory growing dim with the passing of time)? As for how stormy it has been last month— the lows are popping up at around normal frequency of one a week in the Tasman Sea New Zealand area. Some of them have been more intense than normal, and the one that hit NZ just before the shortest day managed to deepen into a Polar Blast, with largest wind rain and snow damage in decades. Maybe that means we will go a few decades before we see its like again? We will close with this exchange of e-mails between Stan and Bob. I have to tell you that your reports are the best I have ever received. It is particularly helpful that you make routing suggestions rather than just report conditions. We used your way points for our trip, they were right on and saved us time and effort in conditions that were less than perfect. We will be spending our season on the boat in Fiji and Vanuatu and would like to continue to use you when we move location or if we see something coming our way that looks beyond our ability. It’s just my wife Val and myself on board so knowing you are available is really nice. Thank you again. I think you managed to steer yourself nicely between two nasties, well done. You should soon be ashore. We have now seen three passages where the magic average boat speed of 9.75/10 knots played an important role in staying out of trouble. How the boat is set up can have an impact, often a large one, on average boat speed. Key factors to keep an eye on are the condition of bottom and propeller, the latter benefiting greatly from smoothness. And then there is displacement. Carrying more weight than necessary for a given set of circumstances may make you feel good, but is it a a major hit on performance. 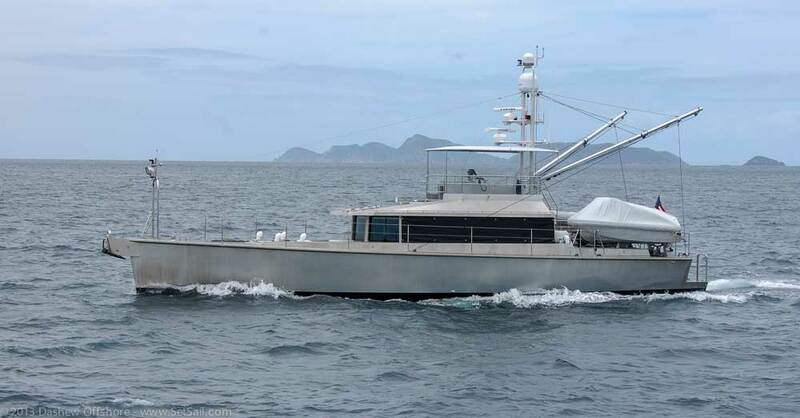 With our yachts and their massive tank capacity – the FPB 64 carries in excess of 3400 US gallons/13,000 liters of diesel and another several thousand gallons/7500l of fresh water – having both fuel and water tanks filled at the same time will slow the boat without any concommitent benefit. We are not sure how other yachts are set up in this regard, but we can say keep it smooth, keep it light, keep it fun. And if you want to end the trip with lots of water, make it the last 24 hours before landfall. For part one of a video of this same passage aboard Wind Horse click here. Part two is here. If you would like to read more about other heavy weather stories in this part of the world, how to avoid them, and what to do if you are caught, see Mariner’s Weather Handbook and Surviving the Storm. This is the fourth and final section on recent passages aboard various FPB 64s. The previous three have shared several common factors: long distances between New Zealand and the tropical South Pacific, voyaging during the equinoctial gale season, and various levels of pressure brought on by schedule requirements. These three FPB 64s each averaged 9.75 knots (or better) at fuel consumption levels that indicated a cruising range well in excess of their destination, which in turn gave them the leeway to run the boat harder if conditions required to maintain their average speed. While these three passages were reasonably comfortable, there were undeniably periods when the folks aboard would have told you they would just as soon have the breeze and sea state back off a bit. Now a contrasting approach, one where there was no schedule, other than that dictated by weather. Nobody has booked tickets to fly and meet the boat, and there is no crew about whose reservations to fly back the owners have to consider. Couple this with a pragmatic, and conservative approach to weather, and the result borders on the sublime. John and Sandy Henrichs have been messing about in boats for years. Like many of our clients, John had been a commercial airline pilot, a heavy metal driver as we glider pilots refer to them. During their first cruising season they had taken crew on their passages. But they came to the conclusion that life was simpler and more enjoyable on their own , with just one of the benefits being the aforementioned lack of outside influence on schedule. John had been watching the weather pattern for several months when they were finally ready to depart. Although he was using the services of two weather routers–it never hurts to have a second opinion–John was going to make up his own mind about whether to go, or stay and wait for more optimum conditions. When the weather models did finally look right for their passage to Tonga, they cleared customs, dropped the lines, and were off. But half a day en route the latest data showed several potential risk factors starting to emerge. No guarantee mind you that it would get nasty. On the other hand, with no pressing schedule, why find out the hard way if the weather models were right or wrong? So Tiger turned back to New Zealand to await a more pleasant outcome. And when they finally did depart, a few days later, conditions were more favorable. We’ll join John and Sandy now aboard Tiger, on their way to the Kingdom of Tonga. John Henrichs picks up the story. June 8 – We are 53 hours into the trip and have averaged 9.7 knots, even with the current on the nose. The past 6 hours the wind has died down a little to SE 17 and seas are just aft of the beam by about 30 to 40 degrees, at 3 meters with a nice long period. This is the first time I have experienced this sea condition and we are riding the waves just like a surfer. Long runs with the swell and speed stays up over 11 for a long time. Max speed so far is 12.7, but most of the time it’s up to 11 to 11.4. The STW is following the GPS minus the current. Last 6 hours in these conditions we have averaged 10.6 based on plotted lat/lon and checking distance on chart plotter. We started out at less than 9.5 during the first 24 hours due to the current and seas, but have steadily been increasing to the present 9.7. Not too bad for a fully loaded boat. We are running at 1750 rpm, load is tough to tell, but between 45 and 50% due to surfing and fuel between 5.0 and 5.5 again depending on swells. John and Sandy have made several important points with this passage. The first is to be patient, understand the weather patterns in your area and season, and be prepared to change tactics if the conditions dictate. Since they were not on a schedule, John and Sandy had the luxury of turning back when the models changed their story, and then waiting for more comfortable conditions. They then kept the boat moving fast to stay within their target ETA. Having come from a long association with traditional power boats, where surfing, lack of control, and the risk of broaching were synonymous, we are pleased they have discovered the fun of surfing on a yacht that is easily steered. Finally, John’s comment about the passage being too short may seem like an oxymoron, but we can attest to the fact that once you get into a rhythm with the boat, the days pass, and whether you are on a five, ten, or twenty day crossing as long as it is is comfortable, it is not unusual to be sorry the voyage, and the serenity you can feel under way, are at an end. Of the four FPB 64s that we have discussed, three are enjoying the pleasures of the tropical South Pacific. Iron Lady, with Pete Rossin driving, has toured the Society Islands of French Polynesia, worked their way through the Tuomotus, and will shortly stop in the Marquesas Islands before heading for Hawaii, and eventually the Pacific Northwest. Buffalo Nickel, with Stan and Val, are exploring the many lovely anchorages of Fiji, and Tiger with John and Sandy aboard have been cruising Tonga, prior to heading downwind to Fiji. The Henrichs are now addicted to surfing–to the point where they are going to await reinforced trades with which to make their passage. This insures good surfing. We look forward to more sea stories from them. This entry was posted on Sunday, July 7th, 2013 at 7:36 pm and is filed under Dashew Logs, Favorites, FPB 64, FPB 64 Passages, FPB 78, FPB Series Notes, one. Both comments and pings are currently closed. With all the talk of surfing ability I have not seen mention of the FPB’s bar crossing abilities. This notorius youtube video https://www.youtube.com/watch?v=qp9WvZzxdR8 comes to mind and I wonder if many owners and/or yourselves have much experience crossing bars in the various FPBs built to date. or if you have any general comments.